The Brief: A conspiracy theory claims that birds aren't real: that they're really government controlled spy drone robots. Birds Aren’t Real is a growing conspiracy theory. The movement has over 70,000 Instagram followers, 33,000 Twitter followers, 12,000 subreddit subscribers, and dozens of social media pages for local chapters as well. 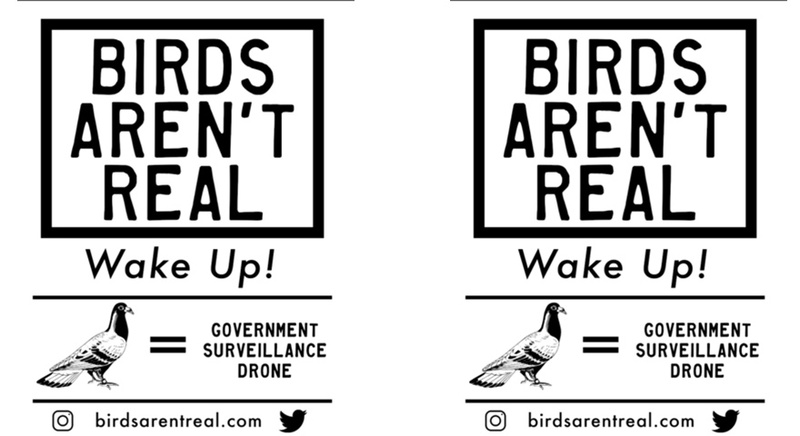 In addition to its online presence, Birds Aren’t Real supporters have launched guerrilla-style flyer campaigns around the nation to inform the public that birds are, in fact, not real. If something as ridiculous as “birds aren’t real” sounds made-up, it’s probably because it is. As with many conspiracy theories, especially ones that circulate online, it can be difficult to discern how many people actually believe in it vs how many are merely perpetuating this theory as a joke or prank. It seems that most proponents of this theory are actually trolling other conspiracy theorists and people gull-ible enough to believe them. Birds Aren’t Real frequently pushes its merch line of “activism gear,” seeming to sell to both people who see the movement as a funny joke, and those who believe in the theory. It seems to be poking fun at the absurdity of conspiracy theories more broadly. Much of their rhetoric parallels that of conspiracy theorists like QAnon and Alex Jones with used like “Wake up America!” and “Killary.” The parody becomes more clear with statements like “Obama is a bird” or that JFK was assassinated after refusing to implement a government-controlled robot bird system. Although there may be some followers of the movement who take the conspiracy seriously, it is largely a comedic meme around an absurd premise.